Imagine the oldest and largest video rental store IN THE WORLD, featuring free beer on Tuesdays, obscure films and knowledgeable staff. 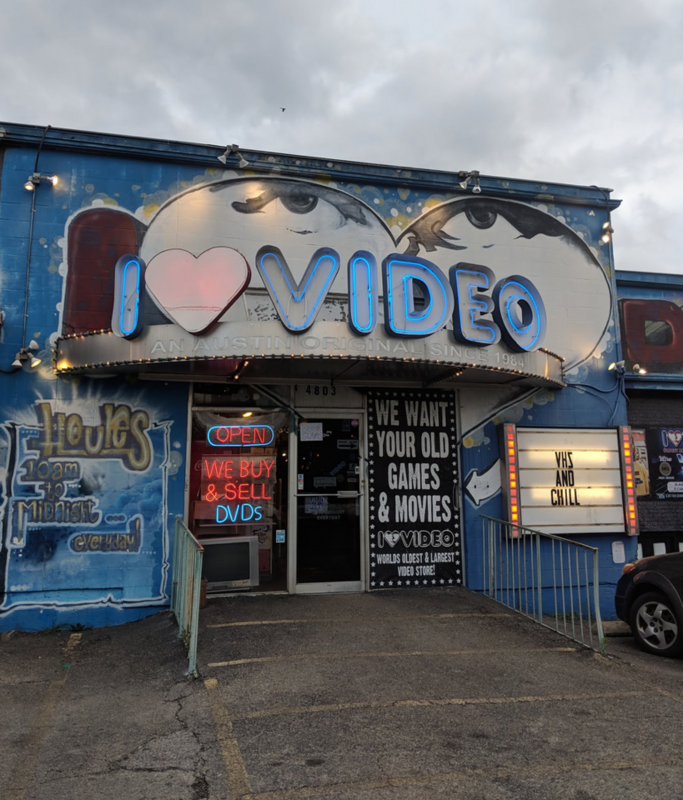 Imagine no longer: this is a real place, I Luv Video, in Austin, Texas. Video is one of the world's largest independent video stores, offering an immense catalog of films for rent & sale... we have a friendly, knowledgeable staff who's as obsessed with movies as our clientele. While other video stores, from independents to the corporate chains, are succumbing to the lure of digital on-demand streaming, I Luv Video is old-school & thriving. A combination of an indie-supportive, film-loving customer base and a bohemian aesthetic keep I Luv Video culturally relevant and make our stores a destination for visitors. We offer more than just films to rent, we also sell rare & unique vintage toys/movie memorabilia and films. We also provide a unique customer experience and a chance to rave and vent about films with people as enthusiastic as we are! And best part? No late fees! Any video rental store where David Attenborough has his own section devoted to Nature Documentaries right above Ken Burn's Documentaries is clearly one with very good taste. This place is the real deal, as well: thousands upon thousands of films are categorized in two floors of films. Looking for an obscure foreign film? Chances are they've got it. The full seasons of a show that's unavailable on streaming? Chances are they have that too! There's something for the whole family, and even a used DVD, VHS and Blu-Ray section where you can snag hidden gems for a bargain. There's something so compelling about being able to physically browse new releases. The combination of physical media and cover art draws your eye to a movie that maybe you'd skip over elsewhere. Each store display features a variety of fun retro goodies amongst the stacks. Spot the green Teletubby! I have many great memories of working in a Video Store back in the 90's. It's really nice to see that the industry didn't entirely go away. It'd be a shame to miss out on such a fun experience. Talking with the customers, sharing memories about movies and making suggestions. It was a great way to meet people from all walks of life. In summary - "This is relevant to my interests" and if you're in the Austin area, it's worth giving I Luv Video a stop!